Designing for the web requires expert knowledge of several programming languages and an ongoing commitment to education in order to stay current in this exploding field. A website must contain relevant and useful information. This requires careful consideration of your target market and the specific goals you wish to accomplish. Through careful content planning throughout the site development process, we can avoid the costly re-design that so many sites go through. How do I promote my website on Google/Yahoo? Exciting and effective graphic design is the element most often missing from today's websites. It takes a strong foundation in traditional design, combined with a firm grasp of emerging technologies, to produce the powerful marketing tool that a well designed website can be. While it is true that many of the page layout techniques used in print design are difficult or even impossible to re-create in a web page, the principles involved are still entirely valid and relevant. Preparing high quality, fast-loading graphics for the web involves a combination of experience, talent and the very latest software tools. 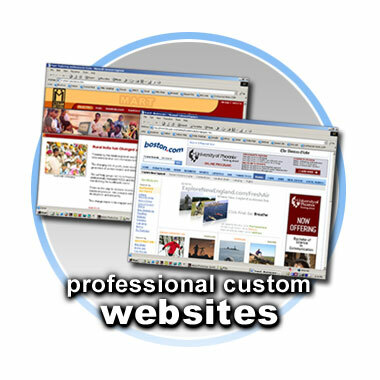 Search engines are responsible for the vast majority of all website traffic. A comprehensive program of submissions and updates is required to achieve and maintain a high profile for your new website on all of the major search engines. Search engine optimization is the process by which the text and code of a web page are tweaked in such a way that search engines like Google will give it a higher ranking in their search engine results pages. SEO is not about gaming the search engines - effective, ethical SEO is about optimising your webpages in such a way that Google and other search engines will do justice when they decide how high up they should appear in the search results. SEO consists of two fundamental elements: producing search-engine-friendly content and obtaining high-quality inbound links. There is a third element that one should seriously consider: which is staying on the right side of Google and Yahoo avoiding any penalties at all costs, since Google/Yahoo are the foremost search engine's and getting banned is pretty much a death sentence for a web site. Here is a list of comprehensive 30 Golden SEO tips for increasing your web site's traffic. We now offer complete, fully customisable e-commerce solutions for your on-line store! Including database driven catalogue, shopping cart, and secured transactions. Whether you need to build a B2B or B2C site, or you're building an e-Commerce Portal, our team will help you achieve your business goals. We can provide you with the best technology, e-strategy, and e-marketing solutions that will guarantee your business success.